Plastic bonsai training pot (brown, rectangular) with the size of: 55cm length, 40cm width, 11.5cm height. Frost proof. 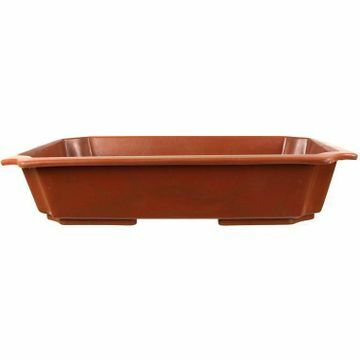 Cheap but good alternative for ceramic bonsai pots during propagation and styling phase of prebonsai or Yamadori (prebonsai from the nature). Is much more frost resistant as a similiar ceramic pot. Another advantage over ceramic bonsai pots: Plastic bonsai pots are much lighter. A plus point is not to be underestimated, especially if you have large bonsai.